Don’t be caught home alone this holiday season. Stay smart and safe online. In 1990, the movie “Home Alone” was released, introducing viewers to 8-year-old Kevin McCallister scheming to protect his family home against two plotting robbers. Kevin had several tricks up his sleeve to con the con men. 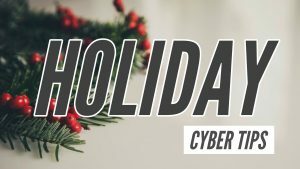 This holiday season, follow these tips from the Office of Information Technology to know how to defend yourself against modern robbers: cyber hackers. “Click the link below to track your package!” It sounds harmless, right? You want to know if Grandma’s fuzzy slippers are going to make it to her doorstep by Christmas Eve. Tracking emails are very common, making them a great tool for cyber hackers. The red flags of phishing apply to all emails, especially those posing from UPS, USPS and FedEx. Check to see what email address the email originated from, and hover over links before clicking. If UPS sends a tracking number to your email inbox, the email should originate from ups.com, and the tracking number should link to ups.com. DUO is required for many on-campus applications, but did you know that your favorite shopping sites offer two-factor also? Two-factor authentication is the best way to protect sensitive data in your account. Enable two-factor on your Amazon account today. If you haven’t already, enable two-factor on your online banking, Venmo and PayPal accounts. Just like Kevin McCallister, you want to make it hard for the malicious actors to get in. Although it can be tempting to connect to public Wi-Fi to snag a quick deal online, do not shop on public Wi-Fi networks. Unless you are connected through a VPN (virtual private network) which encrypts all data, malicious actors can see every transaction that occurs on a public network – including any usernames, passwords or credit card information that is entered while connected to the network. Save the shopping until you’re home and connected to your secure home wireless network. Know where you’re shopping. A simple internet search can bring up many results for the ideal gift, but be cautious of what websites you visit. Before entering any personal or financial information into a webform to make a transaction, make sure the site you are on is secure. A secure site has “https” at the beginning of the site’s address. If you don’t see an “s” you know that website is probably not secure. Keep an eye on your assets. Check your bank account and credit card account online daily. Confirm that you made each charge. Immediately report any discrepancy to your bank. Stay smart and safe online this holiday season. For more cybersecurity tips, visit oit.ua.edu/security.